Apparently many of us share more than one hobby. 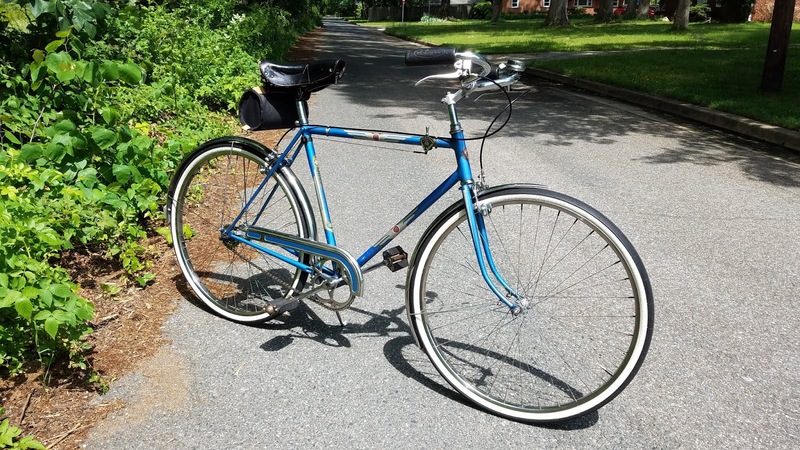 I got it well-used, with a poorly maintained rear single speed coaster brake hub, plenty of chips and dings, and old tubes and tires. I installed a new wheelset from ABC with Nexus 3 speed (hills are too hilly, legs too scrawny and ??? too fat), and new presta tubes. Also swapped to a more swept back handlebar. The mirror is really nice to have. Vintage style headlight on front. I will be installing some other kind of grips, and a vintage looking taillight later. The box I build out of scrap wood and attached to an aluminum rack. My goal was to be able to go to the store for a gallon of milk (which I have now accomplished twice). 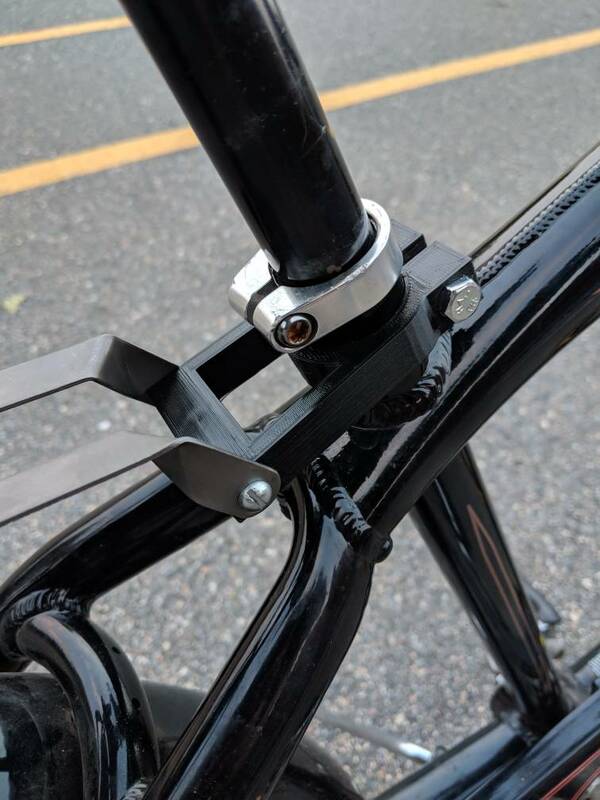 I had to 3d print a bracket adapter for the rack as the bike doesn't have attachment points on the frame. Last edited by azkid; April 10th, 2019 at 08:13 PM. 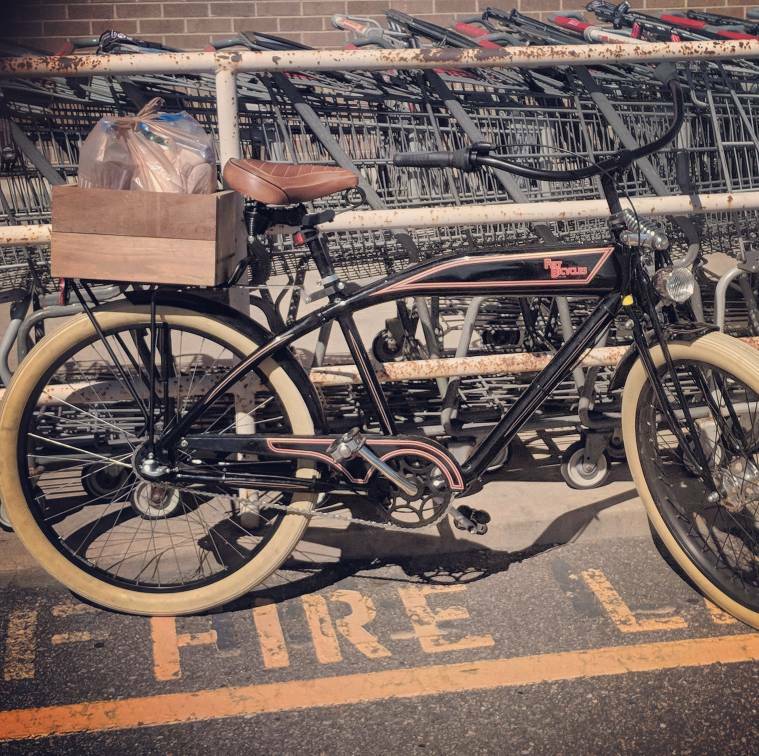 The Surly Pugsley. Fat tire bike made for the mountains, snow and sand! All steel frame. Heavy but worth it. Will go anywhere you think you would want to go. Cross the river, it will float because of the tires. Lower the air pressure and snow and sand is nothing to it. I wouldn’t mind getting the Big Fat Dummy which has the extended frame and is the station wagon/pick up of the bikes. Very happy with it. Decked out with Revelation Design bags. Military tent, military sleeping bag - etc. The perfect off the grid bike. I bought a box of postcards in July... Some interesting ones in there. Some of the postcards have been making their way across the globe enclosed with letters! My current ride. 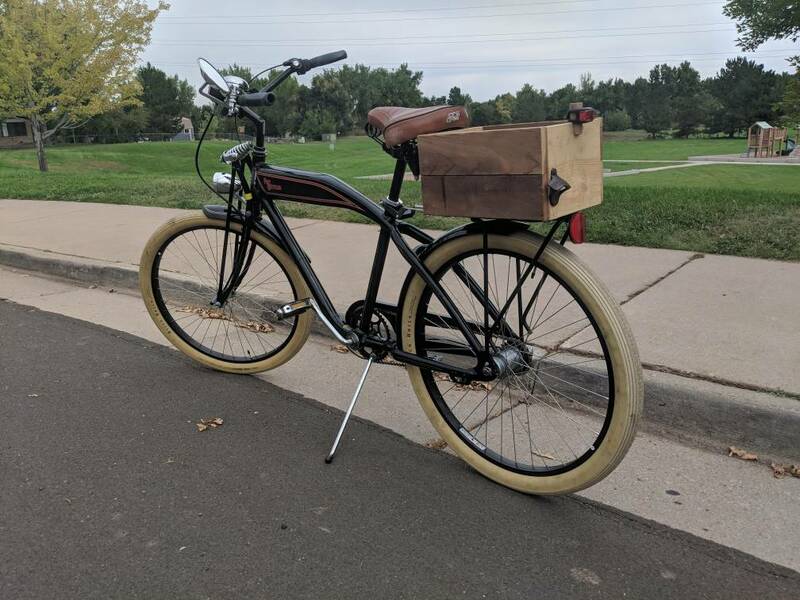 I've added fenders and a rack over the rear wheel (2nd photo). 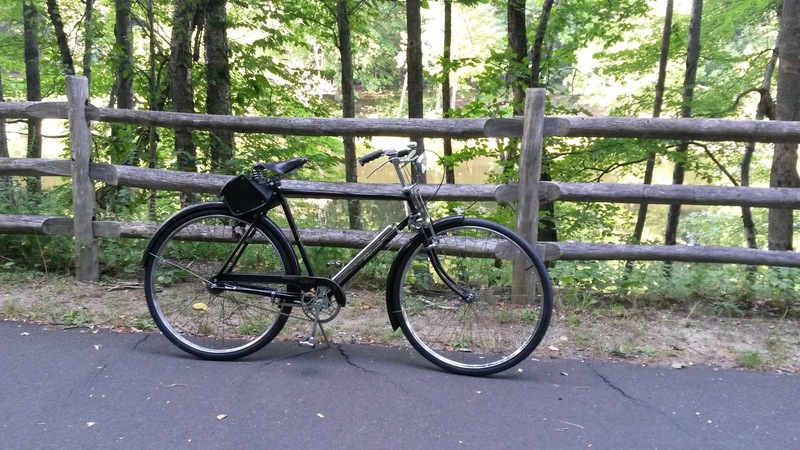 The Brooks B-72 has been with me since I sold my Raleigh 3-speed decades ago. My prior ride. I installed touring bars long ago. Two years ago, a Kiwi living in NYC had me ship it to her after paying almost what I paid for it new in '78. She wanted a vintage bike in the big city. Wonder if it's been stolen yet? Last edited by FredRydr; September 5th, 2018 at 06:18 PM. Well that’s pretty cool...wonder...are the cards from a coffee table book with same name??? 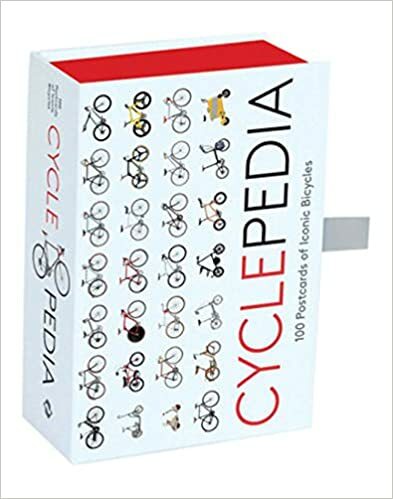 The book, if it is, is packed with great information, from folding bikes, military bikes and fire department bikes. Enough information to where I bought the book. Current bike is a 2017 Nukeproof Mega 275 Comp. 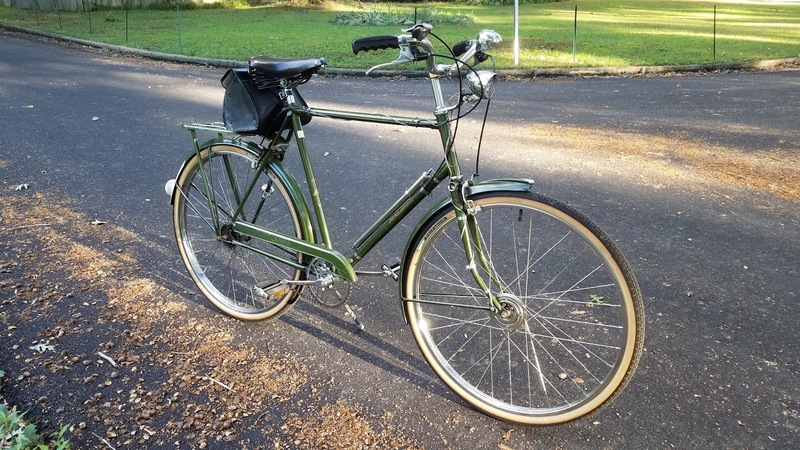 I just sold my old bike which was a home-build. Leader LD-516 frame which was hand-made in San Diego, CA. It was rather patriotic. Last edited by Scooby921; September 5th, 2018 at 09:02 PM. Moulton TSR 2 with belt drive. Gary Fisher Hybrid, my second. First one took a beating after swerving to avoid a driver talky who ran a stop sign. Thanks to a helmet, after bouncing off the pavement, I limped away from it. Lucky, God rest him, loved riding along in his Tail Wagon. I've been re-building old bikes for maybe 23 or so years now, with some of that time more active in re-building than other times. I've probably owned a few dozen bikes over that time, all stuff I've cleaned up, fixed and re-built. It was much harder in the days before the internet became a commonly used thing - you had to go by word of mouth mainly, and common sense. Written materials were around, but scarcer. 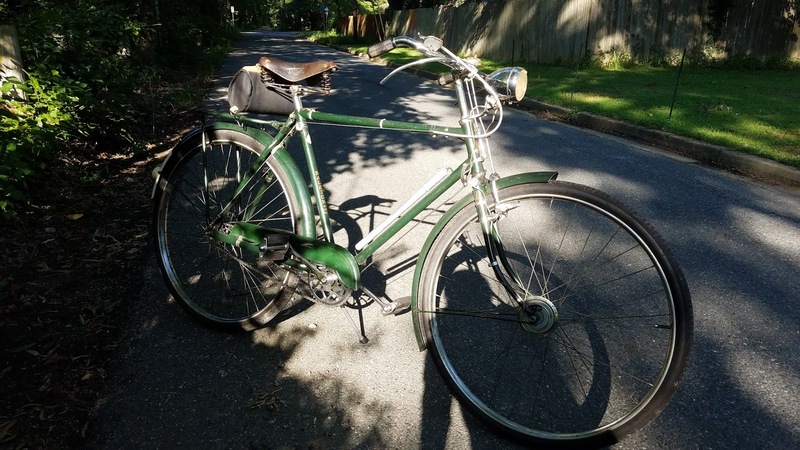 As of today, I'm down to 9 vintage bikes dating from the 1930s through the 1970s. I guess that is still a high number, but it's less than what I used to have back when I'd rebuild a bike every few weeks as a main hobby of mine. 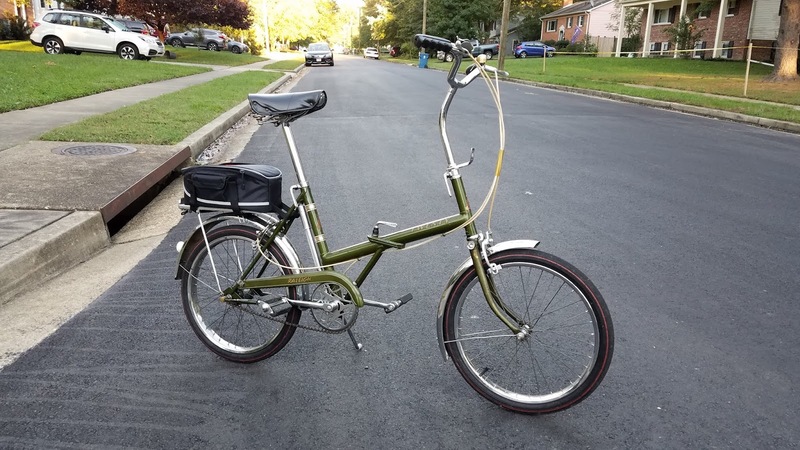 That Hercules was a beast - I used to have to hop on by kicking the bike into motion, standing on one pedal throwing my leg over the bike while it was starting to move. You can learn to do it with enough practice, but it's a pain if you're in traffic at a stop light or a stop sign. I sold it off to a guy who must have been over 6 feet tall. It fit him better than me. But people used to stare at the bike because it was quite a lot of old steel in motion. The "prettiest" bike I ever owned was a 1947 Schwinn Continental. These were the bikes one level below the "Paramount". 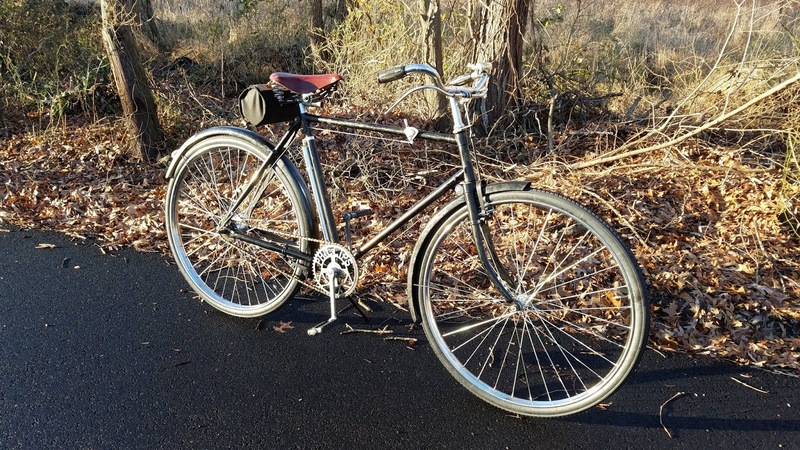 They were basically the second-best Schwinn performance bike you could buy in 1947. The bike was the absolute nicest blue, and had ornate silver "Wings" all over the frame. It had lightened alloy parts and stainless parts all over. The frame was built by hand in the custom part of Schwinn's factory. I sold it back to the guy I bought it from. I really wasn't riding as much as I should have. It was more something you'd display and show off than ride around a lot, though it rode great. 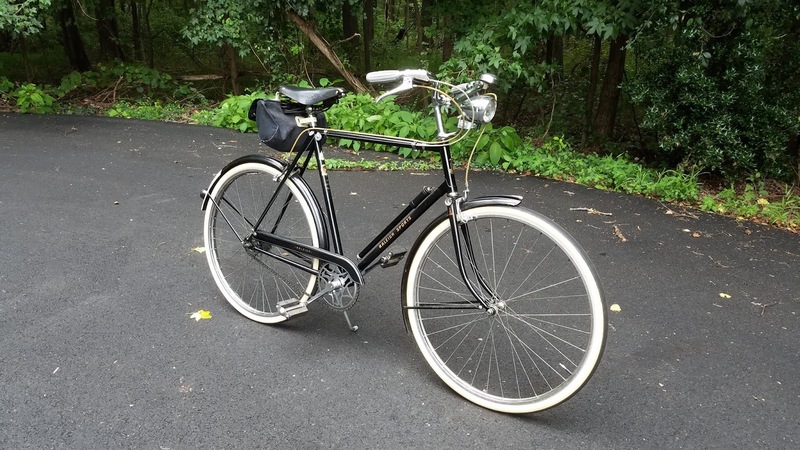 I still have my grandfather's 1936 Schwinn Henderson balloon tire bike, but I can't find any pictures of it. I pulled it out his barn back in the 1990s after he said I could have it. It's my sentimental favorite, though I'll admit I don't ride that one much. The funny thing is that my wife absolutely hates bicycles. I tried to get her interested several times. 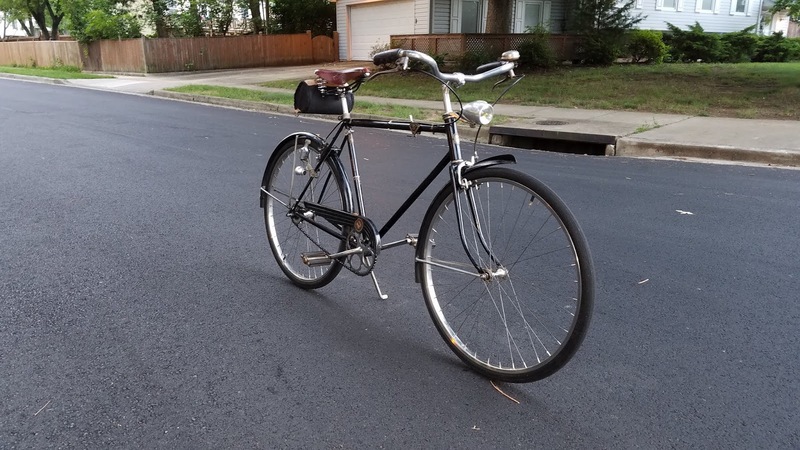 I re-built the old 1960s Schwinn her parents gave her, and I bought and re-built for her a 1946 Hercules 3-speed bike. She just never got into it. She hates that I have so many still, even after I sold probably half of what I used to have off. At any one time, the most I had was probably 15 or 16 old bikes. But in the end, it's just stuff mostly. More important things in life. Sorry to go on for so long, but there's a lot of history in these old bikes so thought I'd share the photos for anyone interested. Last edited by Ray-VIgo; April 6th, 2019 at 08:55 PM. 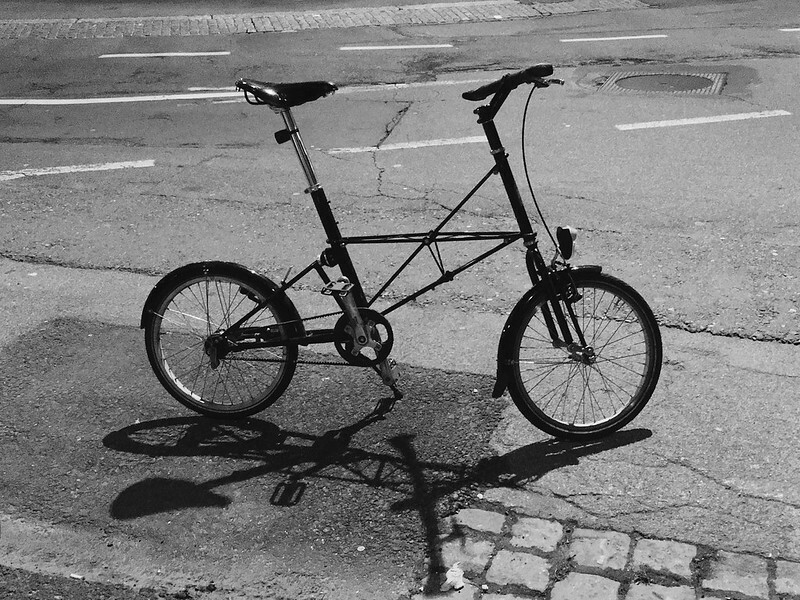 Excellent photographs, wonderful bikes, great blog. Thanks Ray, loved reading the blog, and some of these pictures bring back old memories. When I worked in Nottingham I used to drive past the Raleigh factory every day. I wonder if I'm the only visitor to this thread who doesn't own a bicycle? Maybe. I own and use a bike but it's an (shock horror) e-bike. I'm fairly decrepit and I like a battery to do my pedalling for me, or most of it, anyway. Ray-Vigo, those bikes are all gorgeous! Last edited by SchaumburgSwan; April 10th, 2019 at 08:42 PM. I hope you went for it. I just returned from my first spring "shakedown ride" on the Cumberland Valley RailTrail, laid on the abandoned right-of-way of one of the oldest railroads (perhaps second after the B&O) in the USA. The patch on my front inner tube is holding quite nicely. I left my pens and writing kit in the car. Last edited by FredRydr; April 16th, 2019 at 08:45 PM. Two bikes here - and Łapa's carriage (przyczepka) and Łapa. A couple of friends and I leave on our third Wielka Wycieczka Rowerowa (Great Bicycle Tour) next week, this time the northeast of Poland. Mine is the Specialized in front.